I’ve got a fancier desk now but am back down to one monitor because the CRT didn’t fit. I’m seriously digging my new Samsung 191Tplus monitor, and wonder if I could increase my productivity by buying another 🙂 Some good news is that The Lamp is gone, replaced this past weekend with track lighting. Life is good. I guess I don’t feel like waxing philosophical at the moment, except to say that it’s been a great ride so far. Pete: heh, no. 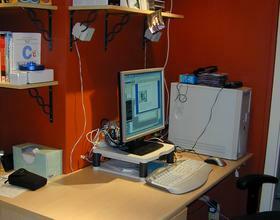 I used to code by the light of this horrible lamp that sat on top of my computer case. See the picture in my first post. I don’t miss it! Wow, you painted and everything. Like the color, and the shelves, too. Is your wife’s workspace to the left of yours, around the corner, or is the whole thing your workspace? Hi Lisa — thanks, and hooray for painting and new furniture. The workspace is mine, mine, mine. But the wife has a nifty one of her own in another part of the house.